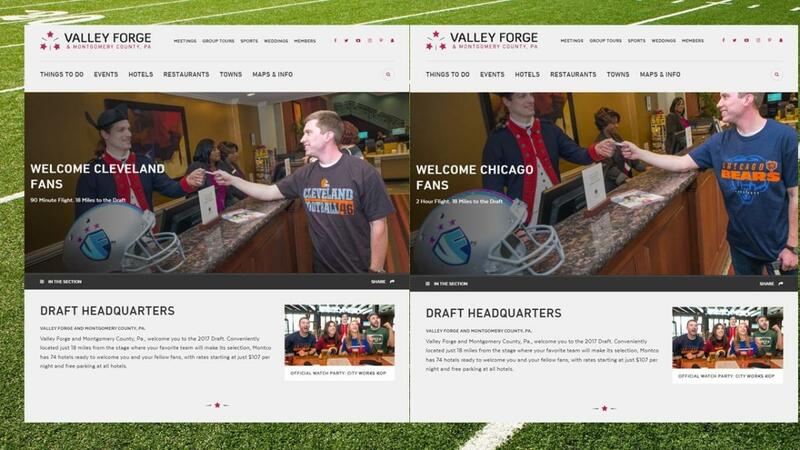 KING OF PRUSSIA, PA – Citing over 70 hotels and 600+ restaurants within a short drive to Philadelphia, the Valley Forge Tourism & Convention Board (VFTCB) is reaching out to football fans around the country to attract them for April&apos;s NFL Draft. In addition to hotel rates that begin at $109.99/night, the VFTCB is touting 50+ golf courses, plus adventures like indoor skydiving, running-cycling trails, rock-climbing, trampoling, go-karts and other high-adrenaline things to do while here. Further, it is marketing free parking and innovative approaches to brewing/distilling in the county. All tourism information being pitched to football fans is on the VFTCB website. But the most unique aspect of the initiative is the way it’s being executed, especially out of market. “The adaptive content feature built into our new website allows us to create an online experience that&apos;s customized specifically for the visitor or reader at that moment. Football fans clicking on our site from Cleveland receive a specific message and unique photo. That content will differ from fans who likewise click from places like Baltimore or Chicago,” remarks Edward Harris, Vice President of Marketing & Communications at the Valley Forge Tourism & Convention Board. To pull this off, the Valley Forge Tourism Board completed a photo shoot with fans wearing gear from 15 different NFL franchises. The photos were taken at the DoubleTree King of Prussia, as well as the CityWorks bar and restaurant, which recently opened at the new King of Prussia Town Center. CityWorks is already planning a large party for the NFL Draft weekend. “We know football fans follow their teams year round and they’re interested in the NFL Draft. Through Facebook targeting, we’re able connect with very specific fan segments within a wide range of geographies around the country. “Reaching them via our digital marketing is half the battle, but when they click through to our site they find an unbeatable value proposition to stay here for the NFL Draft. Montgomery County, Pa., is hard to pass up for the die-hard fan who wants to support their team this April,” Harris explains. In addition to finding information on restaurants, golf courses, and a wide range of things to do, the site includes a link to “Montco 360,” a group of over 70+ virtual tours that highlight area attractions throughout Valley Forge and Montgomery County, Pa. So far the plan is working. One week after launching the digital marketing campaign, the tourism board has received close to 3,000 clicks to its draft page, with football fans from 15 unique markets.